Acute intermittent porphyria (AIP) is a rare autosomal dominant disorder of heme production. 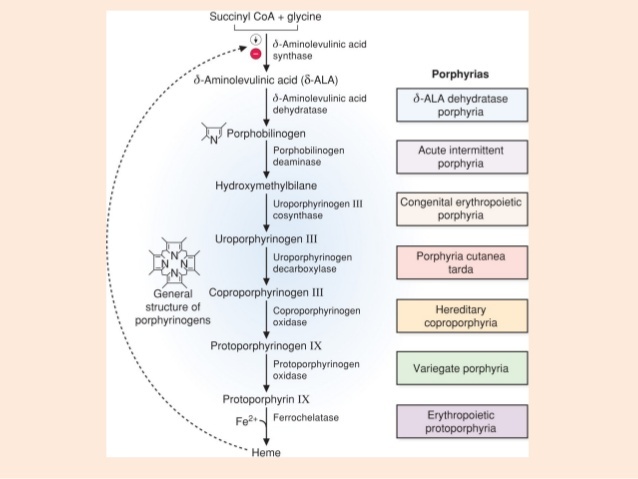 Individuals with AIP are deficient in porphobilinogen deaminase (or uroporphyrinogen synthase, an enzyme in the heme synthesis pathway), resulting in the accumulation of upstream intermediates inside the cytosol—namely, porphobilinogen (PBG) and δ-ALA. Buildup of these two intermediates is toxic to cells and can also cause degeneration of myelin. Port wine–colored urine (urine is colorless initially, but exposure to light causes PBG in urine to oxidize and gives urine its color). *A feature that distinguishes AIP from other porphyrias is that it has no sun-induced blistering of the skin or rashes. Porphobilinogen deaminase activity test: less helpful in diagnosis, however the activity of this enzyme can be tested as well. Endogenous heme production can be decreased by inhibiting ALA synthase (the rate-limiting step in heme synthesis). ALA synthase is inhibited by heme, the end product of heme synthesis (feedback inhibition) and by glucose. Patients should receive a high-carbohydrate (glucose) infusion during acute attacks and hematin or heme arginate to help resolve severe attacks (both are hemelike substances). **Giving a dextrose infusion (carb loading) will address acute symptoms by inhibiting certain aspects of the heme synthesis pathway.